You can schedule posts to be published when you want whether it be a specific time, few days or weeks later. 1. 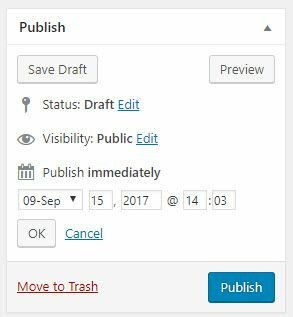 Click on Edit link next to Publish Immediately in the ‘Publish’ module. 2. Enter the date and time you want the post to publish. Your post will be held until the time and date you specified. The time is based on your location settings in your Settings > General page. You can only schedule posts on public blogs. You can’t schedule posts on a private blog. You can also use this method to change the timestamp on published posts to change the order the posts appear on your blog. 1. Open up the scheduled post in edit mode. 2. 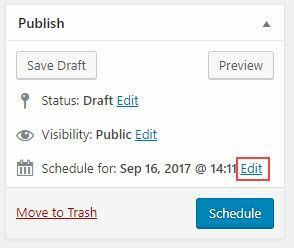 Click on the “Edit” link next to the date for which you’ve scheduled your post in the Publish module. 3. Change to today’s date and time. 6. Your post should now be published immediately. Have you set the correct timezone in Settings > General? Are you using a public blog? You can’t schedule posts on private blogs. Scheduled posts are reliant on people visiting your blog. Try logging out of your blog and visiting your blog’s front page.